This was a particularly meaningful experience for me. 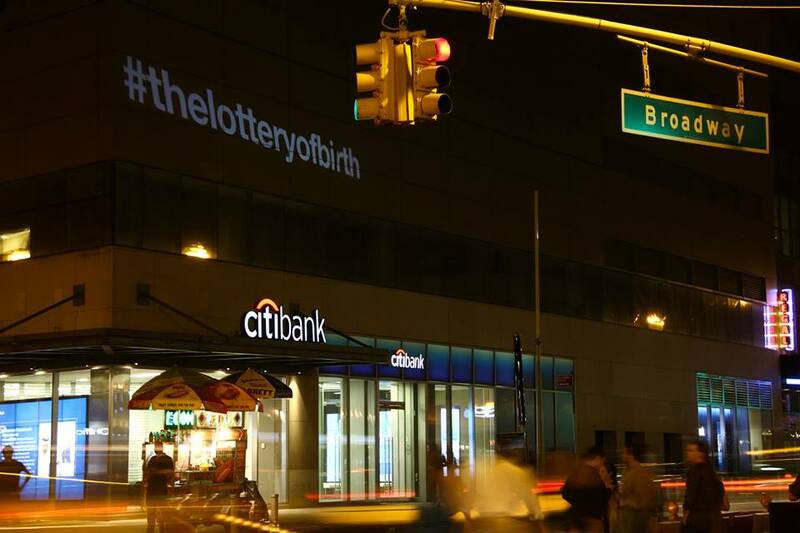 I was the co-director and co-producer of ‘The Lottery of Birth‘ and for several years had poured my efforts into the films alongside the series creator, Raoul Martinez. I had also immersed myself in Occupy Wall Street. From the outset, I became a member of the Media Working Group and participated in the creation of many short films, live streams and social media campaigns that helped to grow, support and document the movement in unprecedented ways. 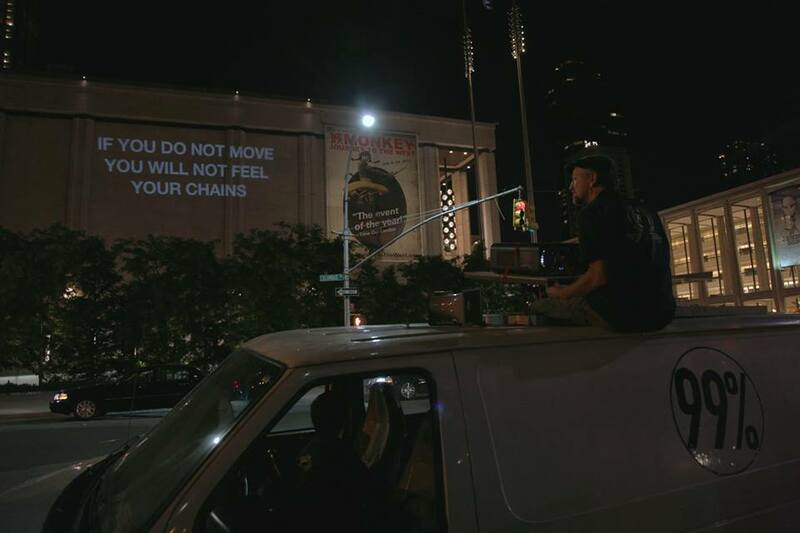 Tactical media produced on the streets of NYC helped spread Occupy across the country and to many other parts of the world. Out of this cauldron of bubbling, radical innovation came ‘The Illuminator’, a cargo van equipped with video and audio projection, as well as a fully-stocked infoshop and mini-library. A shapeshifter and transformer of public space, it switches from a bland white cargo van into a mobile spectacle, transforming sites that are normally used for transit into spaces for community engagement. It disrupts the patterns of everyday life, and embodies the social and political transformations for which the 99% movement continues to fight. A week before our releases, I met with the Illuminators in a community space on the Lower East Side of Manhattan, during one of their weekly get-togethers. Among the team there that would later lead the action itself were Athena Soules, Kyle Depew and Mark Read. It was beautiful to witness a group that worked so harmoniously together. 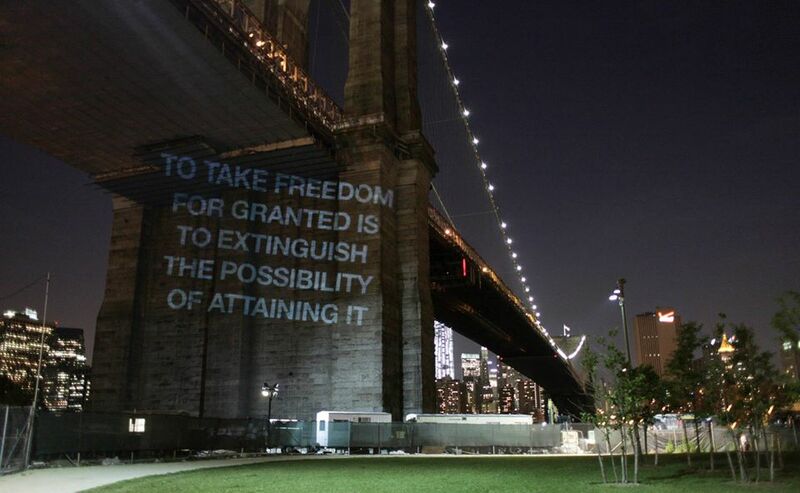 They got what we were looking for right away and the following Saturday we met up in Dumbo and began projecting images and text onto the city itself. We had selected and created a number of quotes from some of our favorite radicals who appear in the movie, along with our own original text. 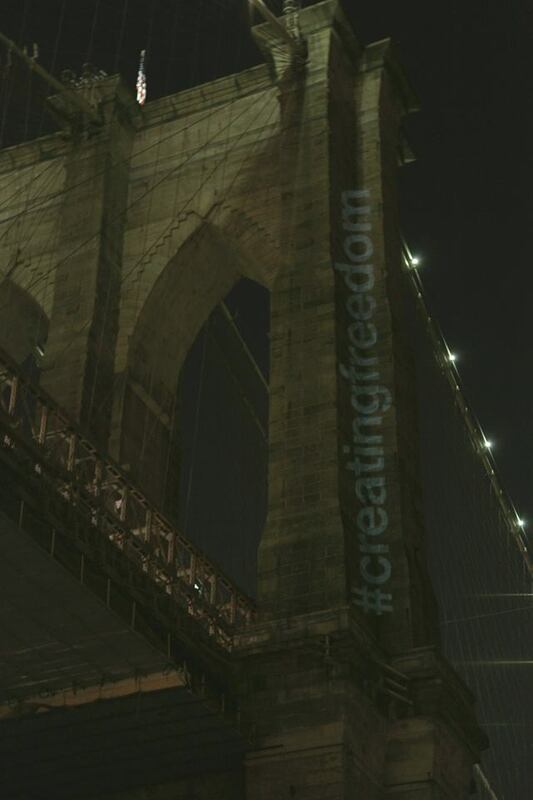 People began to gather as the Brooklyn bridge was transformed into a giant canvas for radical thought! 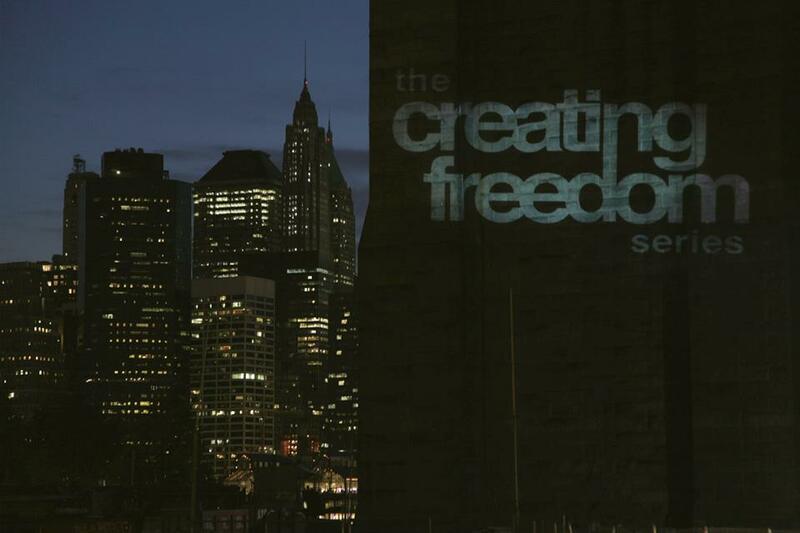 Creating Freedom and the Illuminator lit up New York that night, with faces, images and clips from ‘The Lottery of Birth‘. 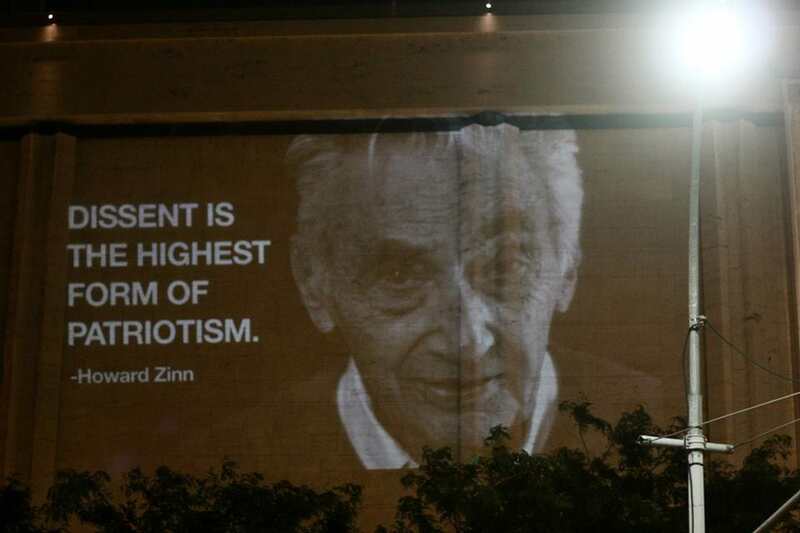 Uptown at Lincoln Center, people began to gather outside the David H. Koch Theatre at Lincoln Center, as we projected Howard Zinn‘s face onto the facade of the building, with his famous quote, “Dissent is the highest form of Patriotism”. Later, down at Union Square, we occupied Citibank’s walls with our trailer, and calls to #QuestionEverything. Passersby around buzzed around the van, asking questions. Turning to social media, we quickly saw that our hash tags had been picked up by hundreds of curious New Yorkers and other supporters. Although it was just a single evening, the work that we did with the Illuminator was a resounding success. 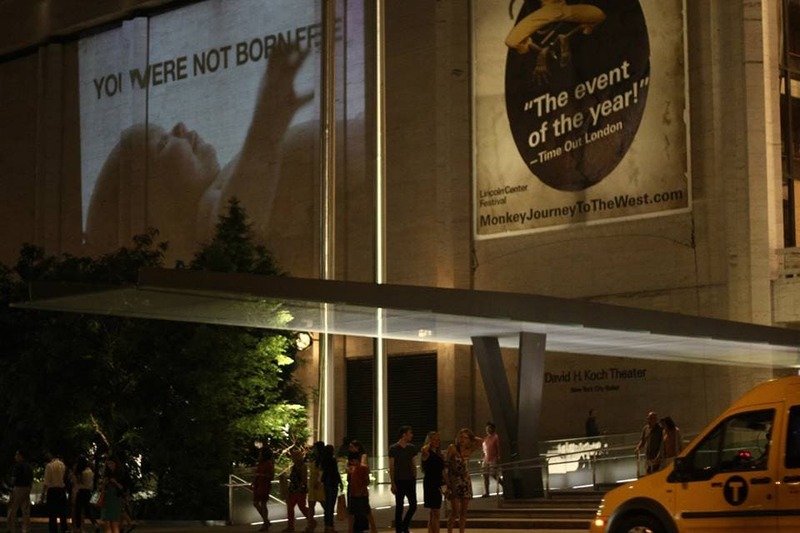 Not only was it an exhilarating experience that spoke to the guerrilla-style approach of our doc series; it also showed how independent filmmakers and activists who share a common passion for radical social change can collaborate in ways that liberate us from traditional models of top-down, corporate-sponsored marketing and promotion. The Illuminator is doing extraordinary work and must be supported. I for one can’t wait for another opportunity to get out into the streets and #Illuminate! Joshua is an award-winning filmmaker working in both documentary and narrative formats exploring themes of social justice, interculturalism and exile.